I’ve always been a sucker for all hi-carb dishes, especially noodles. For me, noodles have that particular texture of chewiness that is simply more addictive than rice/grains, and I still think that Indonesian noodles are the best among the rest of Asian noodles. Now, If you’re looking for comparison of several famous noodle joints in Jakarta, especially West Jakarta, you can refer to Irene’s blog post here (although little of them is edible–halal for me). In fact, she wrote quite a lot about noodle I suspect she’s a noodle girl herself! Haha. Out of everything that she wrote, I used to love Bakmi Alok the best. But that was until I found out that even though it says Chicken Noodle, it still however contains oil coming from pork fat/lard. So yeah, guess I have to find another noodle joint that resemble Alok the most. 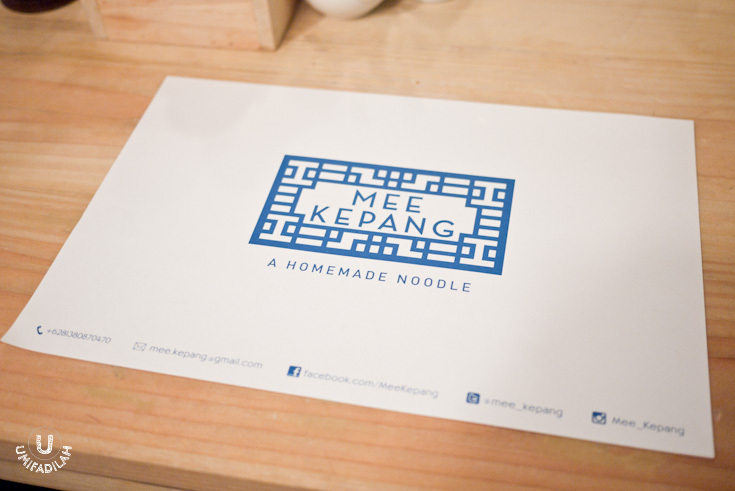 Anyway, so I’ve heard about this new noodle joint close by SCBD (Sudirman Central Business District) area, named ‘Mee Kepang’. Curiosity brought me, again, through Twitter, so I decided to give it a try. They claimed to serve fresh homemade noodles, a typical noodle categorized as ‘Bakmi Karet’, literally means ‘rubber noodle’ because of its thickness + chewiness. 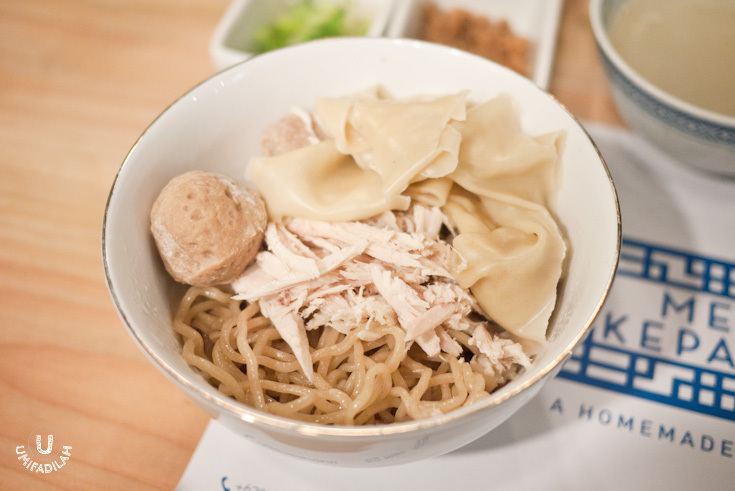 A great bowl of noodle is first decided by tasting its broth. It’s a crucial part on how you would get the idea whether the whole meal’s going to be delicious or not. So after a sip of their original broth, man, was I reminded of Bakmi Alok’s infamous broth (supposedly without the pork thingy, lol) – it was light yet so rich in flavor, has that thick meaty after-taste, no overpowering MSG saltiness, it was just really good and tasty. It soothes your throat and gives you a smile boost right afterwards, and it’s just a perfect start. A perfect start to the main thing. The noodle itself. 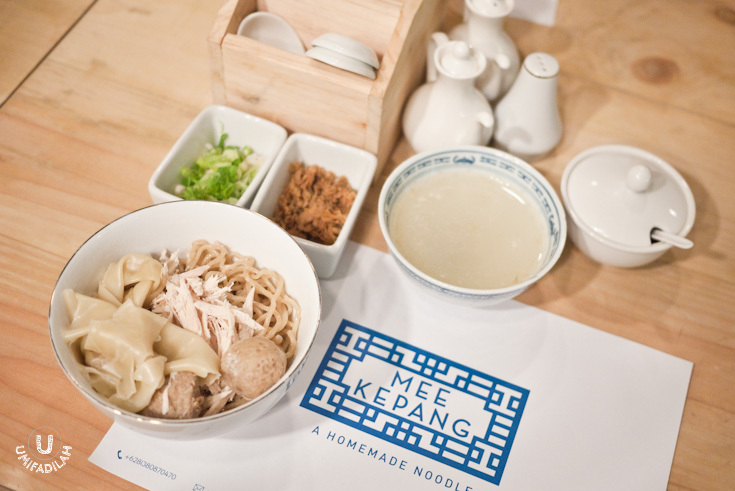 Mee Kepang’s noodle is the main selling point here, and it begs to differ from the rest franchised noodle joint. It’s not too thick as udon, not too thin as ramen’s noodle, but it’s quite bigger than your regular chicken noodle street vendor’s. It’s thick, bouncy, also more chewy than any of them (in a good way) and seasoned perfectly with suffice amount of chicken & garlic oil. The addition of shredded braised chicken meat on top is there if you ordered the original, and turns out for me it’s enough – no need to add wontons or meatballs no more. You should also know that this is one of those kind of noodles in which you have to pour the soup/broth before MIXING them altogether, THAT’S exactly how you can max-out the flavor of one hearty bowl. Somehow the noodle gets way tastier when being drenched thoroughly with its broth. Yum! Definitely must try. Es Jeruk Pontianak, IDR 20k. Pontianak oranges’ have been quite popular for its sweetness. And this small bottle contains pure orange juice without no sugar added at all. Refreshing! Liang Tea ‘Magic Liang Cha, IDR 15k. I’ve always been a fan of this typical Chinese Liang Tea. It’s not too sweet, that’s exactly why I love them. Do hop inside Foundry 8 when you’re near SCBD. 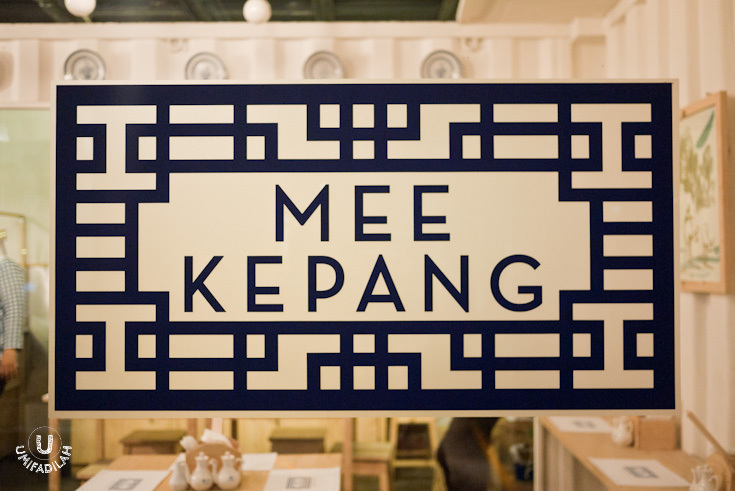 That’s exactly where Mee Kepang is located. It occupies a small space that would only support <20 people at once, but trust me it’s worth a visit – flavor wise. My only objection would be the portion size. It’s considered to be quite small and some might find them not as fulfilling. And for that small portion, price range of IDR 29k to IDR 37k is definitely not cheap compared to other noodle joints. But hey, let’s talk quality over quantity first (and I do understand that “location” might be the key reason behind the unusual price). 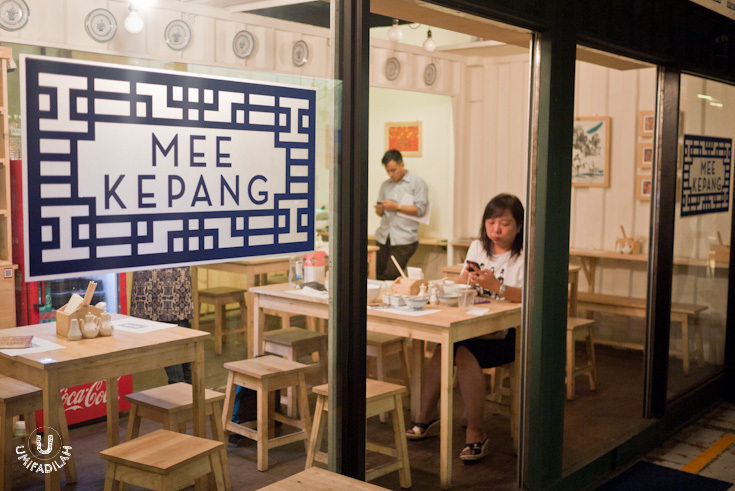 With that said, I strongly think that Mee Kepang is aiming more to a certain mid-high class. Let me know if it suits your taste bud, because it hits mine quite well.